The size of an application block cannot exceed 40 acres in a 24-hour period. 1,320-ft (1/4 mi) buffer zone around spray area, meaning no one can be present within 1/4 mile of the application area for 24-hours post treatment. Written permission from neighbors is needed if the application extends into neighboring property. 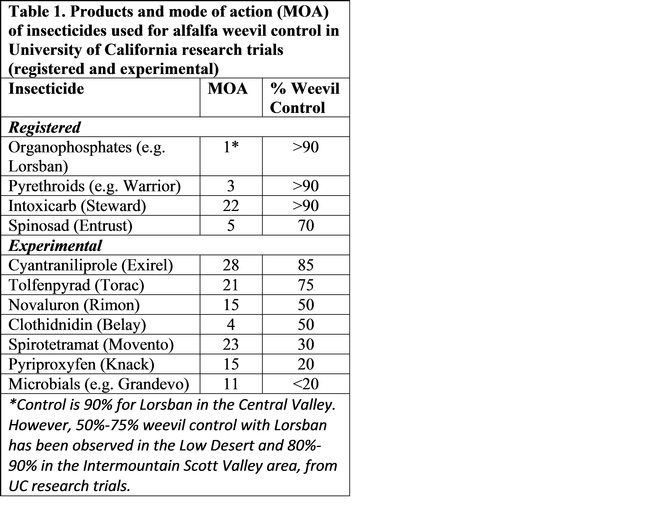 150-ft setback from sensitive sites (e.g. residences, schools, parks), where no chlorpyrifos can be used, even if the sensitive area is not occupied during the buffer zone period. Chlorpyrifos is similarly restricted for use in almonds, walnuts, asparagus, citrus, vegetables, cotton, garlic, onions, grapes, and peppermint; check the permit conditions for each crop. More information on Chlorpyrifos Interim Recommended Permit Conditions can be found at: https://www.cdpr.ca.gov/docs/enforce/compend/vol_3/append_o.pdf. These permit conditions are recommendations from CA-DPR to Ag Commissioners. While commissioners have some discretion, according to DPR, they would need to justify implementing less stringent requirements. The restrictions include the use of mixtures with pyrethroids (products such as Cobalt or Stallion) that are used for weevil control, so check the label for presence of chlorpyrifos. Why are these permit conditions needed? What other insecticides are available for weevil control? There are a limited range of alternatives to chlorpyrifos. Pyrethroids (e.g., Warrior) are still working well in the Central Valley, but are facing issues of pesticide resistance in the Intermountain area (specifically Scott Valley) and the Low Desert area (around Blythe). Steward (indoxacarb) works well, but it is an insect digestive poison and is slower acting during cooler weather (weevils not feeding as much), so higher rates may be needed for good control. Some growers tank mix Steward with malathion or a pyrethroid to quickly knock down weevils for control during cooler temperatures, but this may promote resistance. Steward alone does not control aphids. Entrust (Spinosad) is available for weevil control for organic alfalfa production, with control at about 70% (suppression not control). 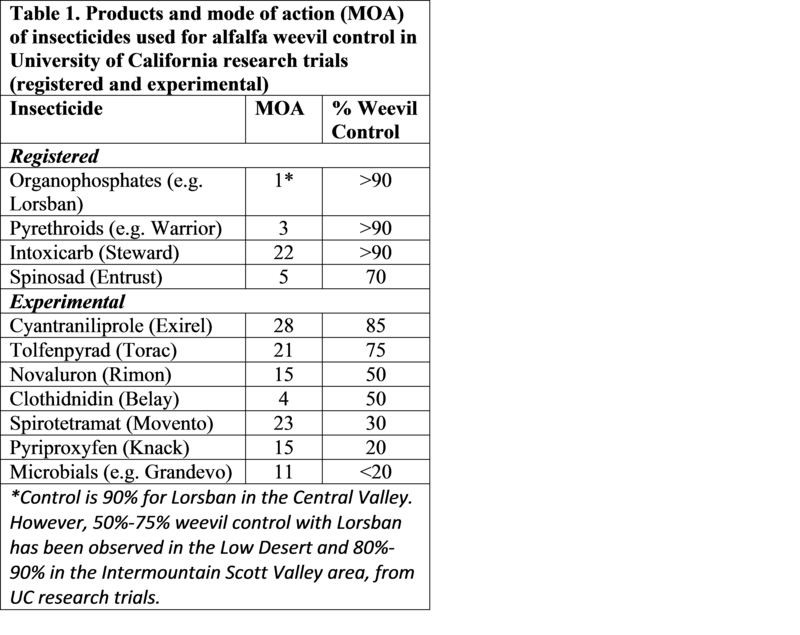 We have conducted research trials for weevil control for many years at UC Davis and in several California locations to look for new products with new modes of action (MOA, see Table 1). So far, we have not come up with anything that provides better control than the pyrethroids and Steward as alternatives to chlorpyrifos. We will continue to conduct insecticide trials in 2019 and hope to find products with good efficacy on weevils. 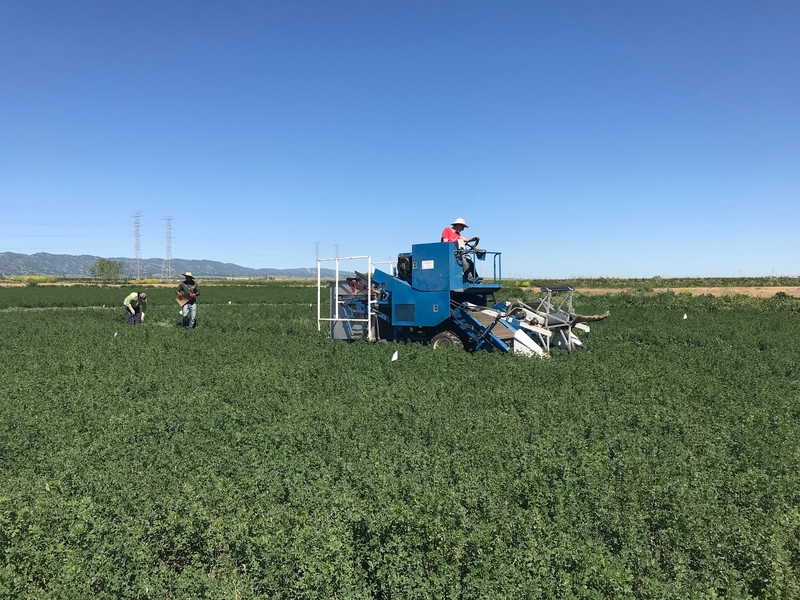 It is likely that many growers will find that these restrictions will severely limit or prohibit the ability to use chlorpyrifos in alfalfa on their farms in California. Keep in mind that chlorpyrifos was scheduled by federal EPA to be effectively banned nationwide (withdrawing of tolerance) in March 2017, but this decision was reversed by the Trump administration. A key challenge for growers will be the development of insect resistance with a limited range of MOAs available. Resistance has already been observed for pyrethroid insecticides at some locations. 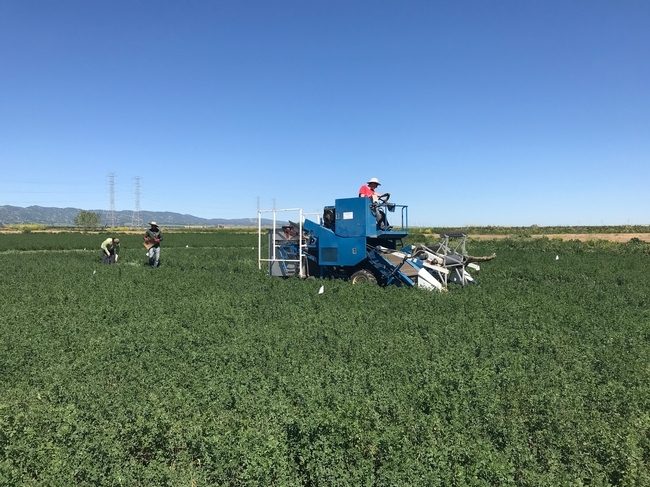 With the ‘loss' of chlorpyrifos through highly restricted use, new MOAs are critically needed for alfalfa weevil control, which will be the focus of continued University of California research.